Turns out that it was ten years ago today that Star Wars Episode VI: Return of the Jedi Special Edition came out in theaters. It was originally supposed to have opened on March 7th, but the Special Editions of A New Hope and The Empire Strikes Back were performing so awesomely well at the box office that 20th Century Fox decided to let them play an extra week before introducing the next one. I remember it well: it was a cold, rainy day that it opened. "Weird" Ed, Gary and I caught it that afternoon at the West End Cinema in Burlington. Of the Special Editions, this was the one that I think I'd been waiting for the most because several months earlier word came that in the final moments of the movie we would see the capital planet Coruscant for the first time ever. 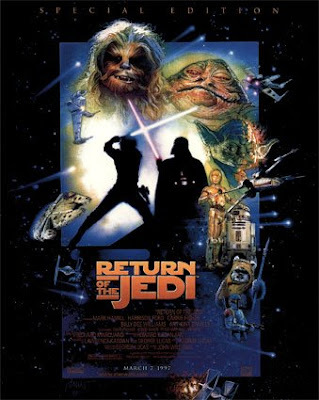 The Special Edition of Return of the Jedi is also notable for adding the beak to the Sarlacc, for the "Jedi Rock" dance number at Jabba's Palace and my favorite change: the new, "upbeat" celebration music at the end of the movie that replaced that annoying "Lugnuts" music from the original version of Return of the Jedi. Now the Star Wars saga ends on a true triumphant note, instead of weird Ewok stick-banging. And with Return of the Jedi's Special Edition opening, this meant that for the first time ever, all three movies of the original Star Wars trilogy were in wide theatrical release at the same time! What at time it was to be alive. Some theaters even had all three playing simultaneously: so you could go to the cinema and watch A New Hope, then The Empire Strikes Back and wind up on Return of the Jedi without having left the theater the entire day. I didn't get to do that though but after seeing each of the Special Editions no less than four times each, it wasn't really necessary. Anyways, happy birthday to the last of the Star Wars Special Editions! And in case anyone's wondering: I do have one of the theater-exclusive Luke Skywalker figures from that day's release (although I bought it at a toy show about 2 years later for fifteen bucks... but I still got one :-).